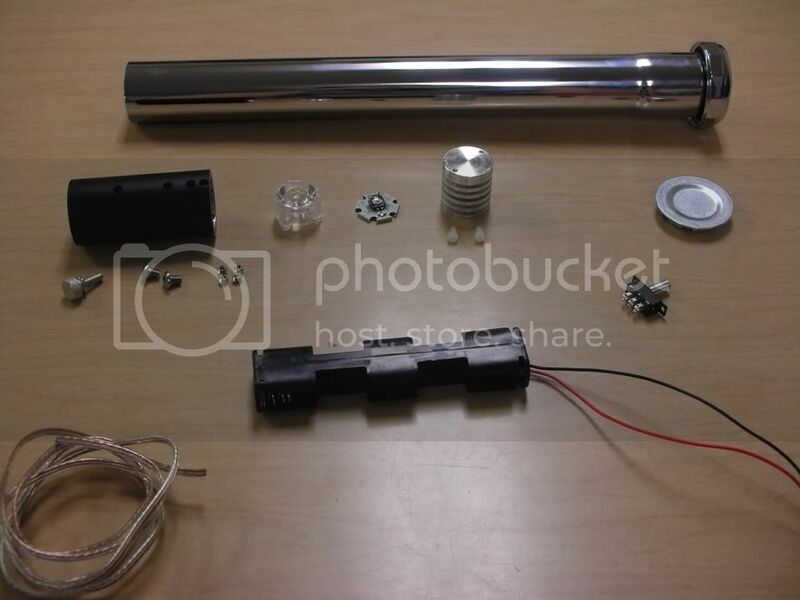 Almost all of the parts used in this tutorial were obtained from www.thecustomsabershop.com. Any other parts can be found online at various sites, or your local hardware and electronics stores. To begin, here is a list of parts and tools needed. A note on the parts shown: During construction, the switch I was originally using shorted out, so I got the rocker switch shown in later pics. It wires up the same. Here is a close up of the blade holder. 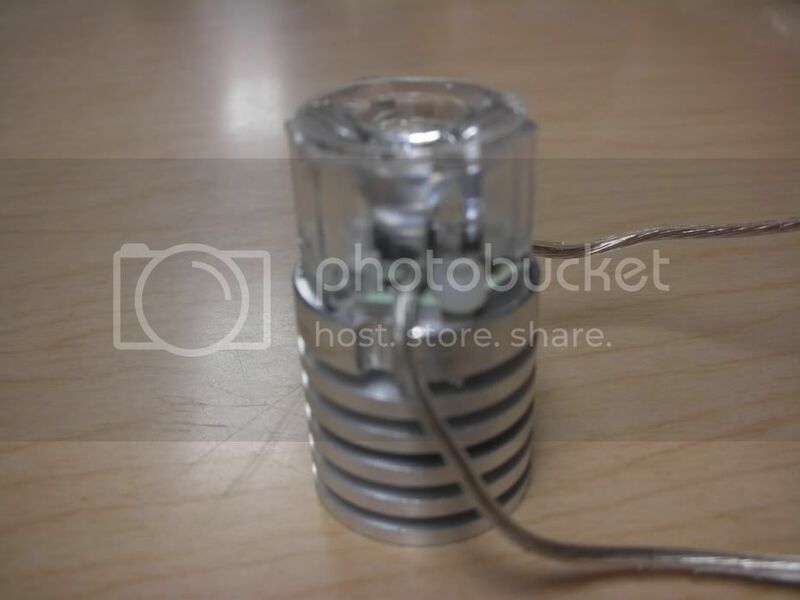 The ribbed piece is the heatsink which the LED sits on. The white nylon screws secure the LED to the heatsink. The headless socket screws secure the heatsink to the blade holder. The button head screws secure the blade holder to the sink tube. The thumbscrew secures the blade within the holder. 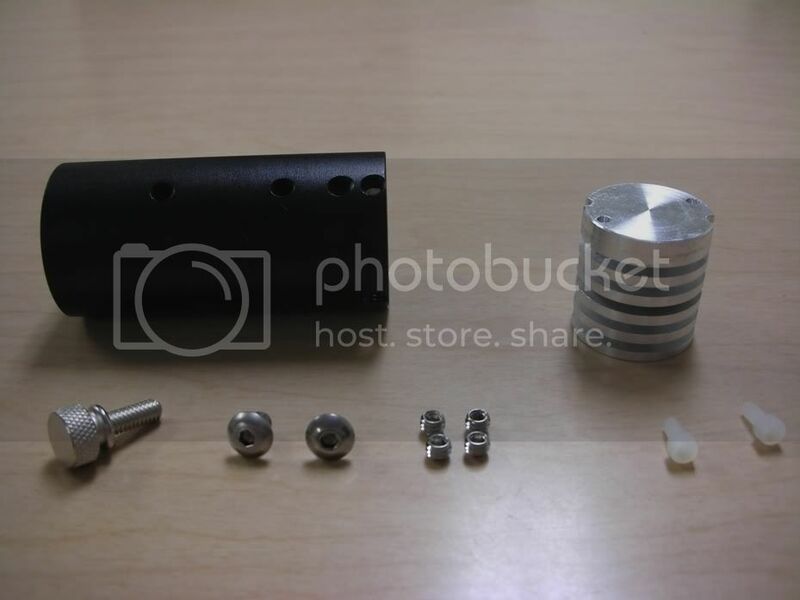 The thumbscrew is not actually part of the kit and must be purchased separately. 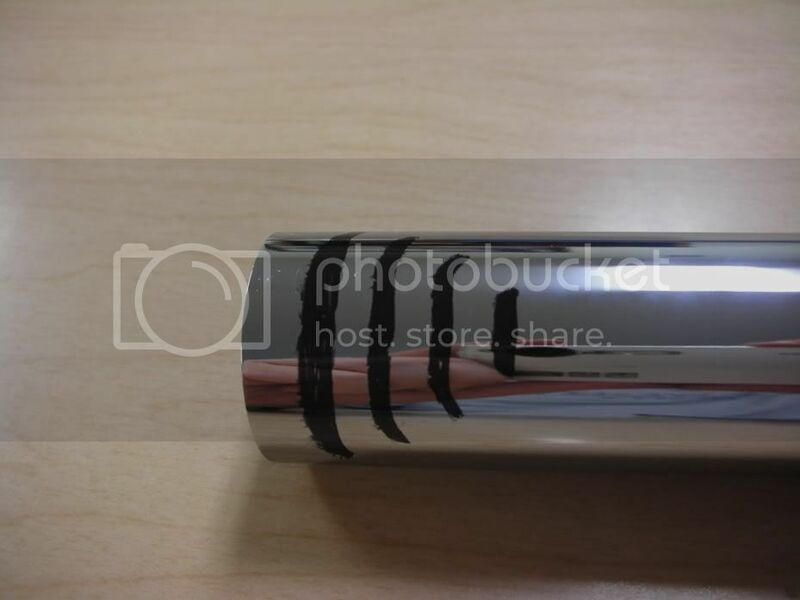 Place the stencil over the tube and trace the image on with a Sharpie or other permanent marker. You want to be careful when doing this as any stray marks are not easy to remove without marring the chrome surface of the sink tube. 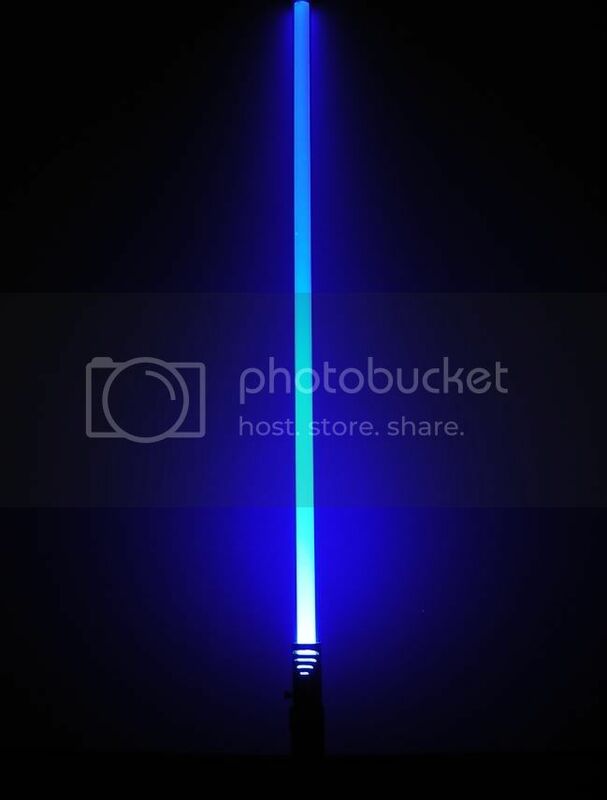 Once you have the image on the saber, cut out the necessary sections with a dremel cutting wheel. Use the polishing wheel to remove sharp edges. I also used the polishing wheel to remove the chrome finish on this one, revealing the brass underneath. Once your cutouts are done, hold the blade holder next to the sink tube positioning it so that the top of the blade holder is just below the lowest cutout. Mark postions of screw holes with the Sharpie. Drill out the holes and test fit to make sure the blade holder slides in and out easily. If not, check the inside of your cuts and screw holes to make sure there are no burred edges sticking out. You will also want to cut down your thumbscrew to the appropriate length at this time. You only want enough coming through to the inside so that it will tighten up against the blade. I recommend holding the thumbscrew with pliers, as it will heat up considerably if cutting with a dremel. 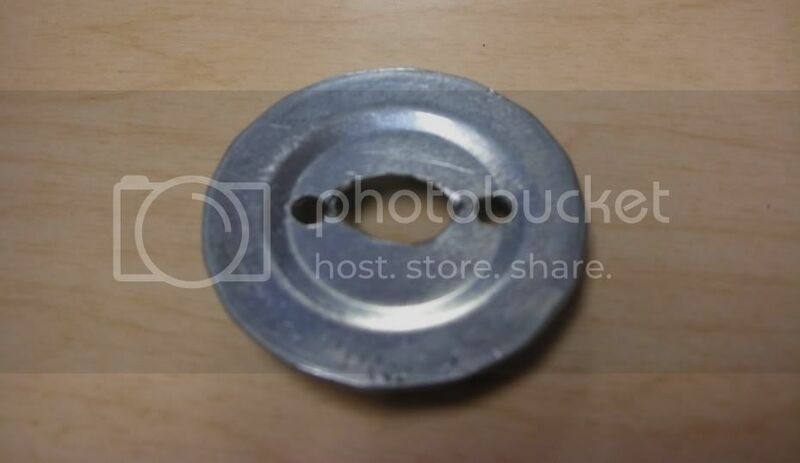 Drill a hole in the end cap large enough for your switch. If you don't have a bit large enough, you can use the dremel and a grinding stone to widen the hole. It's not pictured, but it a good idea to include a resistor on either the positive or negative line between the switch and the LED. Tim has a resistor calculator on the store page that will tell you wcich one you need. I personally have been running a couple of K2 sabers off of 4AA, no resistors for a while, and while they do get a bit warmer, its not ridiculous though and I've had no other problems. Be forewarned though, that pretty much everyone you ask will recommend against doing this. 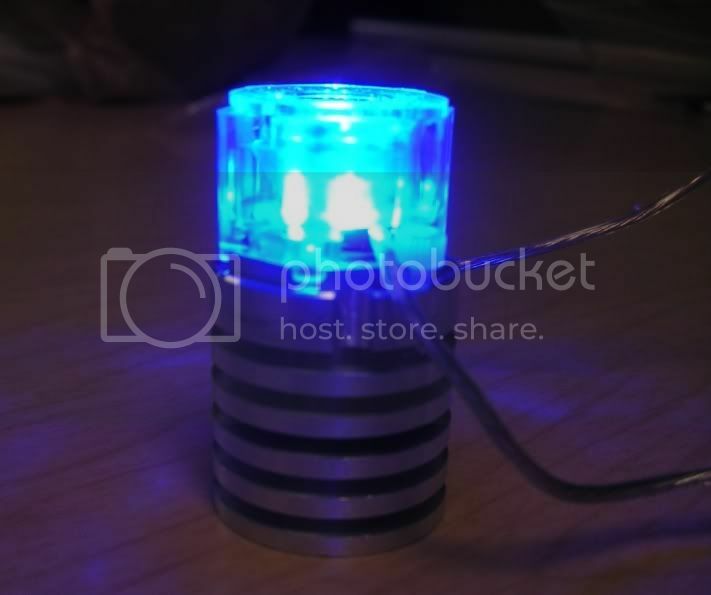 Using the nylon screws, secure the LED to the heatsink. Test to see that the LED comes on and will stay on for a few seconds. Assuming everything works you now want to solder all your connections. If you use the rosin core solder, you eliminate the need for applying rosin to the parts being soldered. Be careful when soldering the wires to the LED. If you accidently touch the iron to the "bubble" on the LED you will probably kill it. With K2's, the pads can be a little tricky to solder to, so i suggest getting a little solder on your iron and transferring a layer to the pad before you try to put the wire on, then solder as normal and it should hold fine. Once everything is soldered, you can go about assembly on the bladeholder. Many people recommend using a dab of thermal compound between the LED and heatsink. This allows for better transfer of heat to the heatsink. From my experience, as long as you have the LED snug up against the heatsink, the heat transfers pretty well anyway. Go with what you feel safe with. Now that the LED is mounted, test to make sure that the optics assembly sits flat on the LED. You may have to trim some of the material on the base of the optics to fit around your wiring. Once everything fits test again to make sure everything works. Slide the bladeholder up through the pommel end of the saber, position it and secure using the two button head screws. Wrap hilt with leather lacing(or however you want to decorate your saber). Insert blade and tighten thumbscrew. Test it out. Congratulations on building a saber! Last edited by darthdan; 07-13-2008 at 01:22 PM. 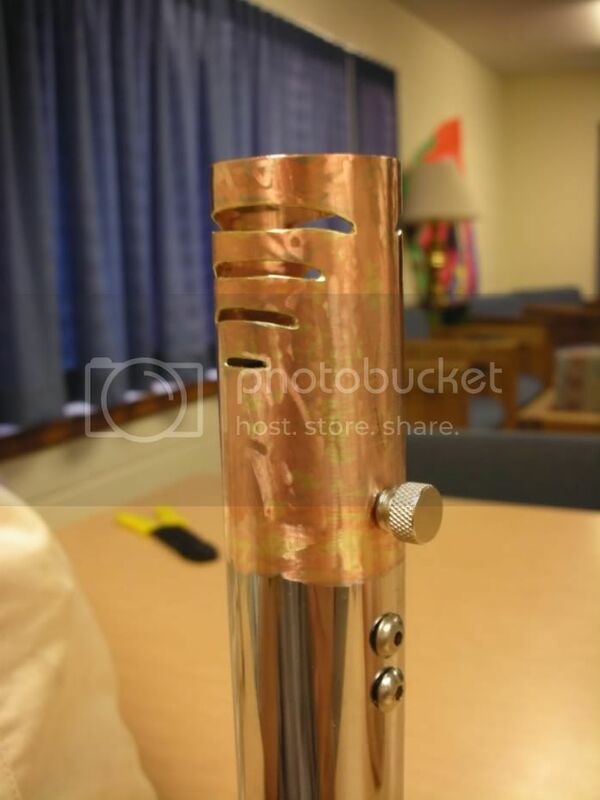 Are sinktubes a requirement or more of a preference? Are they basically used when you want to make more of a custom piece as opposed to just ordering parts through the MHS? There are some things more easily done with them. It's just another option. Sinktubes are usually just cheaper and easier to work with for the tool challenged. One thing that slightly bothers me is that you didn't mention anything about insulating your solder connection between the wires of your battery pack and LED. 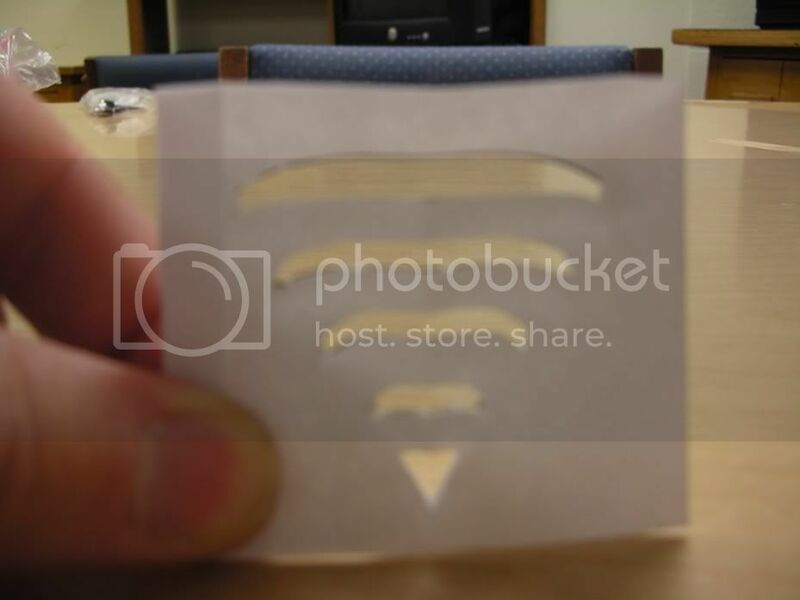 I did see some electrical tape over that connection in one of the pics. K2s don't need any resistors when direct driving them? Last edited by Jedi-Loreen; 04-09-2009 at 11:16 AM. Good call, J-Lo... he did not mention a resistor on the list of parts. Darthdan, that would be a good idea to include (edit the post). UPDATE: He edited the post, so there ya go! You really only need to use a resistor when your total battery voltage exceeds the LED's forward voltage in a decently large way. = you don't really need a resistor. = you DEFINITELY need a resistor! In fact, in that final example you are better off just going 4.5v. The volts "over" what the LED needs get wasted through the resistor. 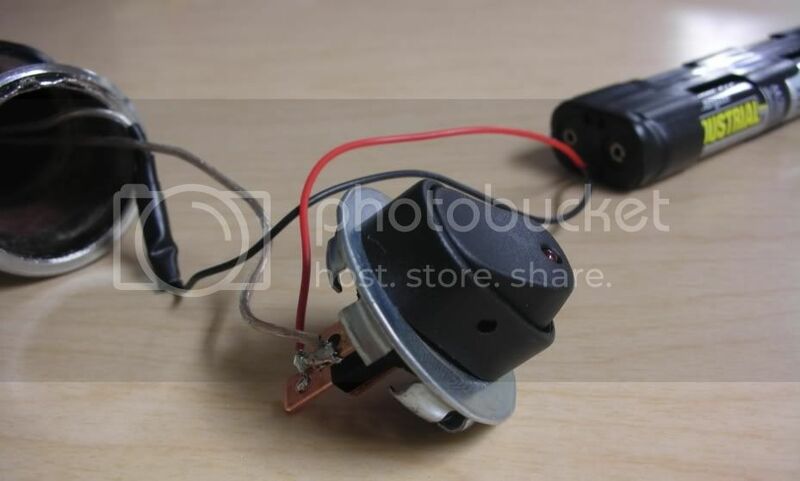 However--when using a DRIVER (Corbin's, Ultra's, Erv's, or some kind of puck)... current regulation becomes an entirely different ball of wax, and you can give a circuit a wide range of voltages, and that energy will NOT be wasted (well, not nearly as much). For example, I have a K2 (1500ma) wired up with Erv's board. It's fwd v. is something like 3.9v or whatever. But I'm feeding it 7.4v Li-Ion (effective 8v)... but Erv's board simply turns the "extra" voltage into more current... which is why it can run for like 3.5+ hours--along with the fact that Erv's board ALSO allows the "flickering" option, which essentially turns the LED on and off, lowers how much current it draws making it brighter here, dimmer here, all in a matter of milli-seconds repeatedly. This also extends battery life. Last edited by Novastar; 07-13-2008 at 02:28 PM. 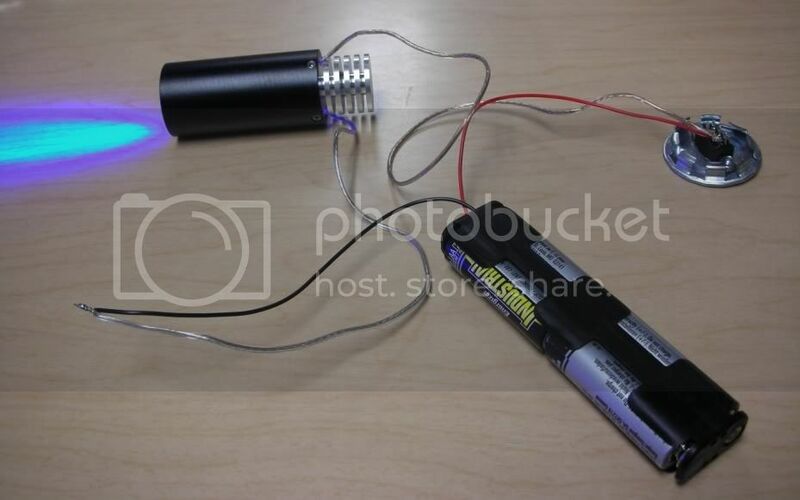 Minus the resistor part, great tutorial. I now realized I have assembled my blade and lens holder incorrectly. 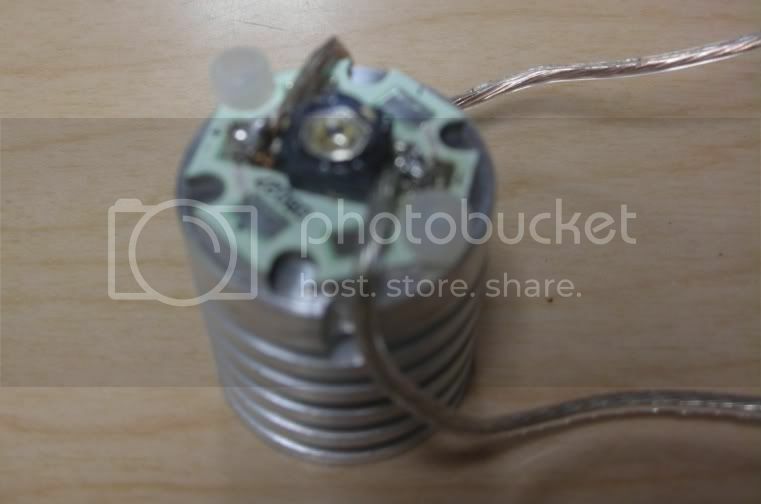 First, where would the resistor for this go, in relation to this build? Thanks, and again, great tutorial! the resistor should between the batt. pack and the LED..
as well as any accent LEDS should have some too..
To add to that, the resistor should be on EITHER the negative OR the positive line... not wired "across" both... in case any new folks were to be confused. By the way, if people were using rechargeable cells, they might want a recharge port... which WOULD be wired "across" both + and -, preferably right after the battery pack, and therefore before the LED switch. Finally, here's at least a recent video I made regarding sink tube sabers with the TCSS 1.25" blade holder. Granted, my video shows the "older" black anodized TCSS part, which is no longer available I believe.